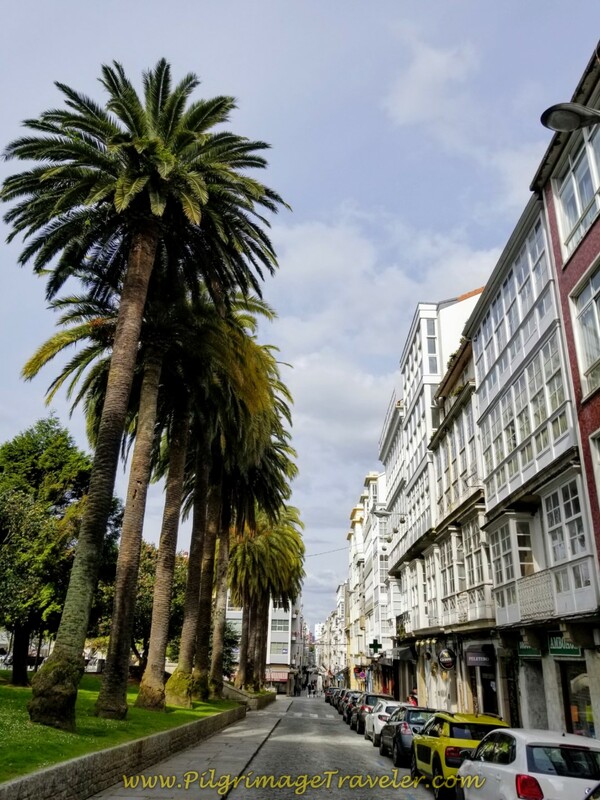 Day one on the Camino Inglés takes us from Ferrol, around the estuary of the Ría de Ferrol and into the town of Neda, Spain. While there are periodic strenuous hill climbs, this day follows the river predominantly. 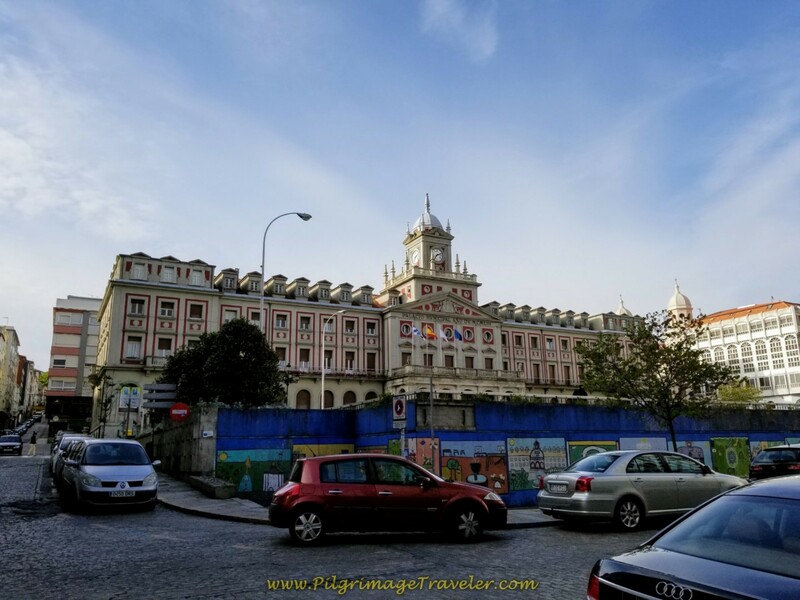 Join us on our journey, of this first leg of the pilgrimage to Santiago de Compostela. 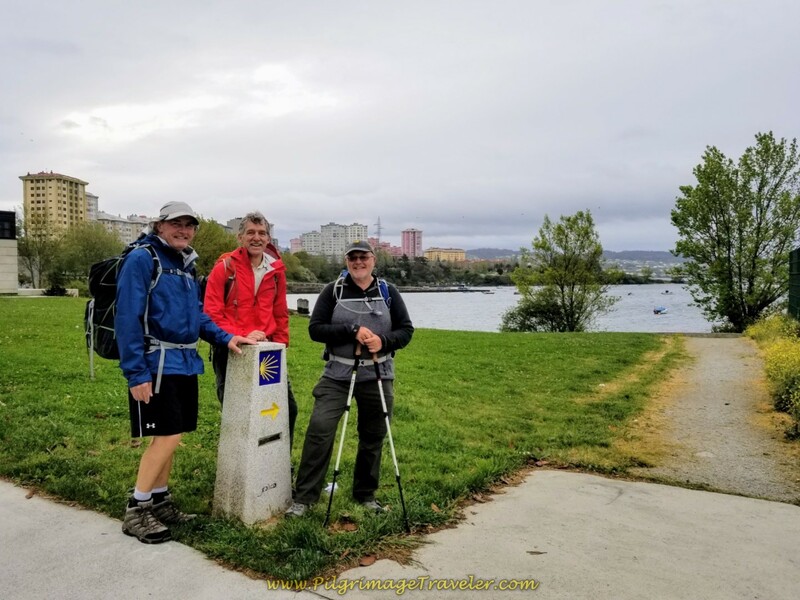 My husband Rich and I and our prior Camino buddies whom we joined in Ferrol, set out on the first day, having walked the first 1.74 kilometers the night prior, from the official start at the docks, to our hotel the Hostal La Frontera. 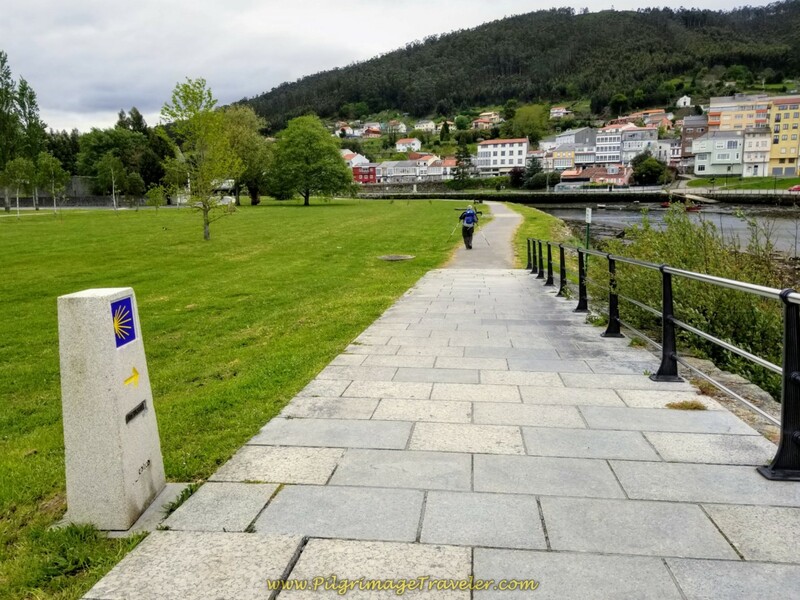 The following morning we wound our way through the streets of Ferrol and along the river, to complete the rest of the 12 kilometer day. Here is our Google map of our journey, from Ferrol to Neda. It is created from our uploaded GPS tracks and I have included accommodations, supermarkets and cafés along the way, for your convenience. The map is totally interactive, so pinch and expand! 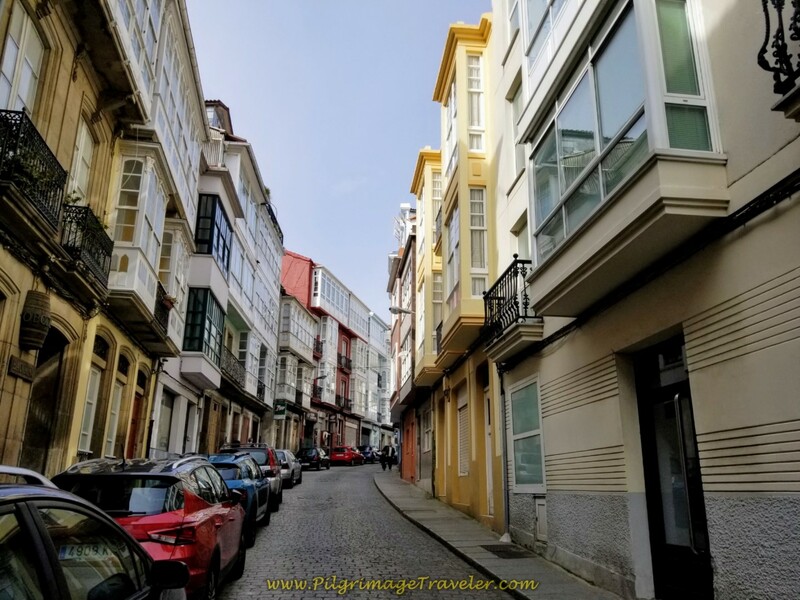 There are no albergues in Ferrol, so you must book hotel accommodations. You can do so by clicking here. It is a good idea to have a reservation before your arrival, as it may save you a lot of headaches, if there is a holiday or it is in the peak summer season. 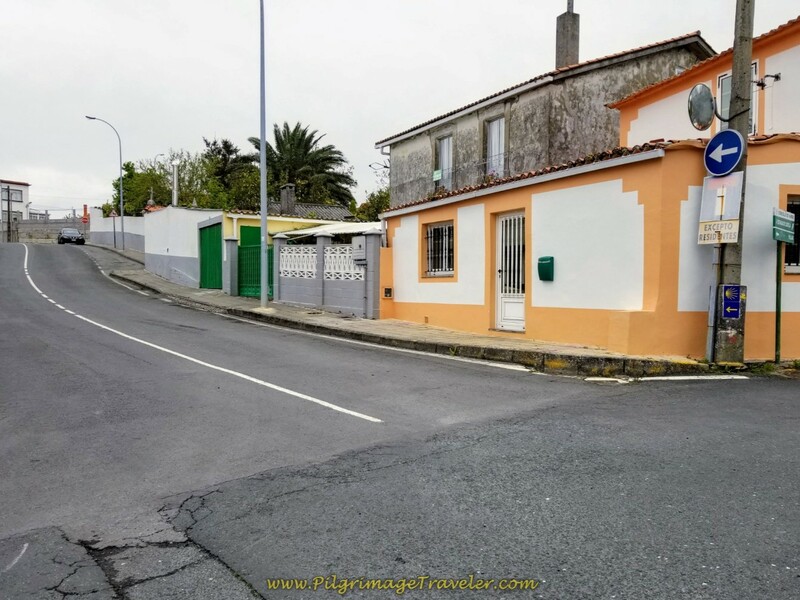 I have stayed in the Hostal la Frontera twice, and it is very adequate, economical and mere steps from the Camino. Plus it has a nice café bar to have your breakfast in the morning. Click on the link to see photos of it. Here is the elevation profiles of day one on the Camino Inglés, in two parts. 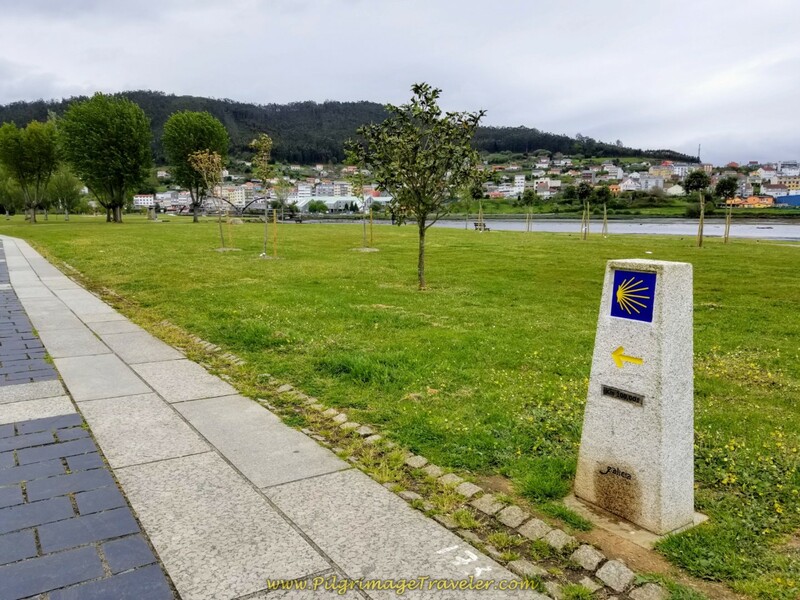 The first is for the 1.74 kilometers from the start at the docks until our hotel in the center of Ferrol. 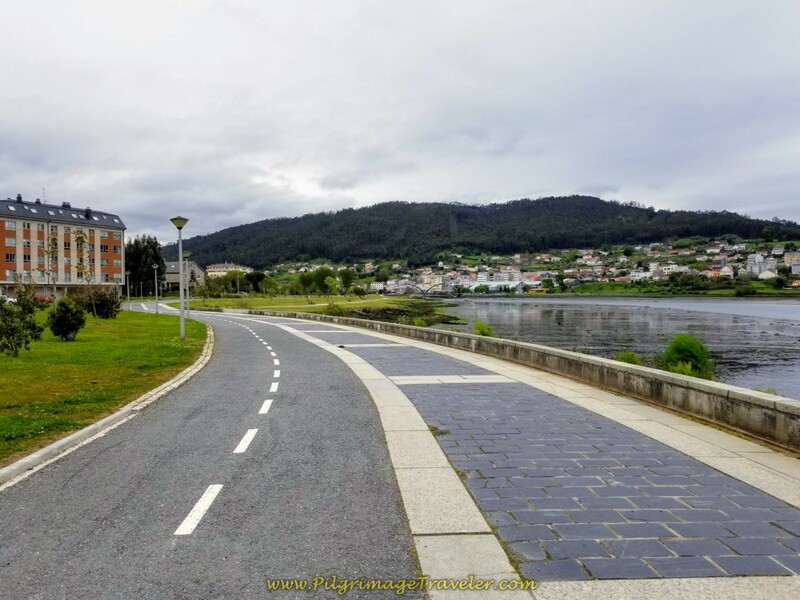 The second elevation profile is for the remaining walk from the center of Ferrol to Neda. If you are a strong hiker, you can combine this day with day two, for an almost 30 kilometer day. The choice is yours. 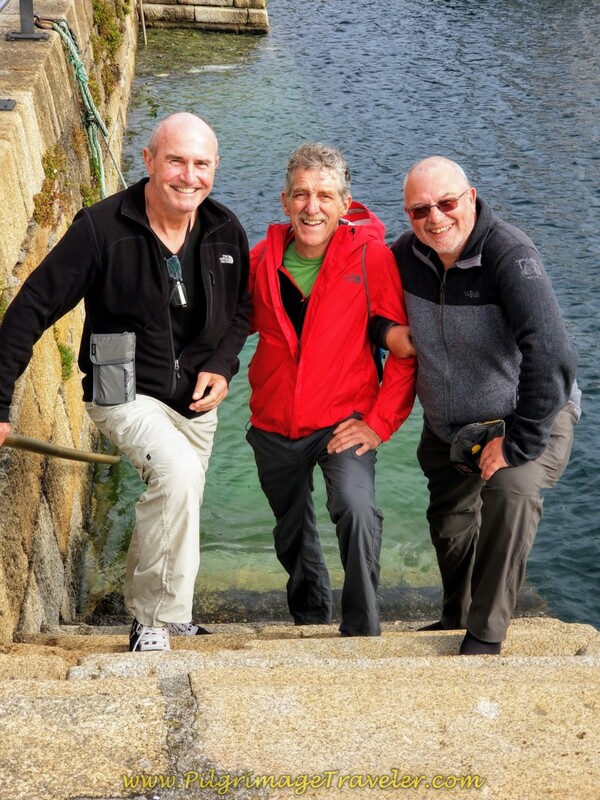 In the Port of Ferrol, shown below, is our foursome getting ready for the Camino, imagining that we have disembarked from our ships onto the north coast of Spain, climbing the steps from our boat! Meet Rob, my husband Rich, Steve and yours truly! Camino friends reunited! Rich and Elle Also "Arriving"
This was a special reunion for the four of us, having walked together for portions of the Camino Portugués the prior year. 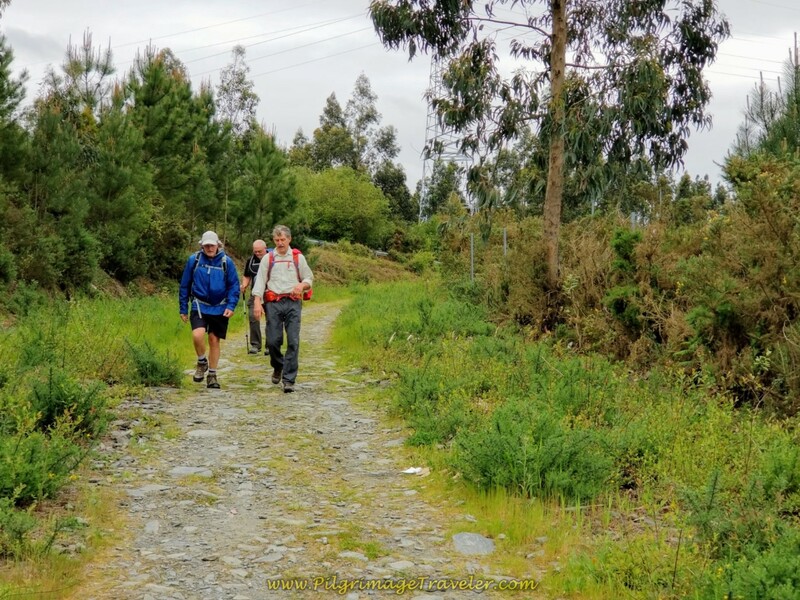 Steve had even longer Camino connections with Rob. It is amazing how many life-long friends we have made from our Caminos. 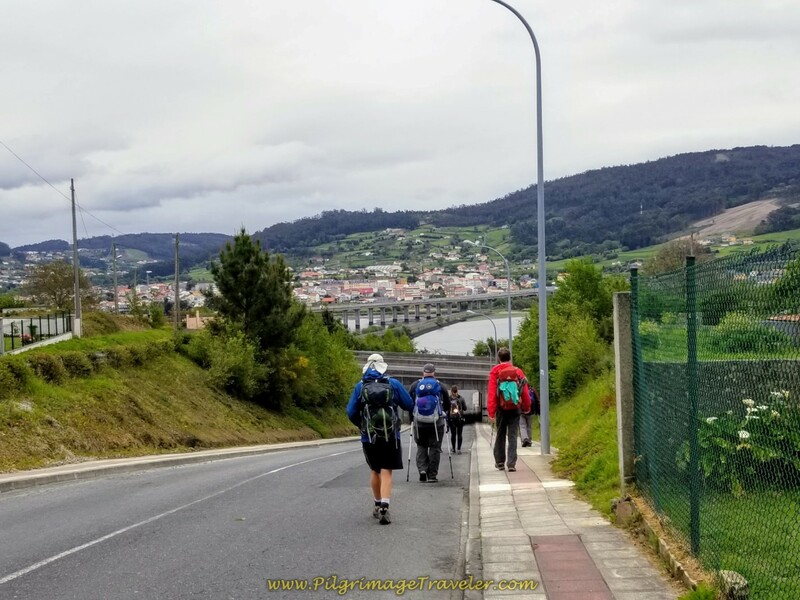 It was also a special time for us, because Rob had been newly diagnosed with Parkinson's disease and I was hoping to see the Camino from a new perspective ~ his. I admired his courage to set off with us, as he strove to maintain his physical abilities. 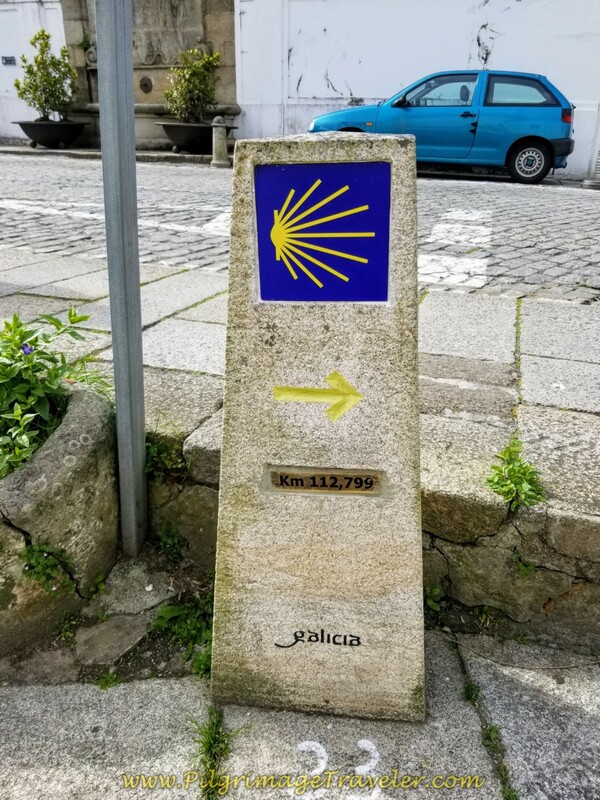 None of us knew what this Camino would bring us, but we were setting out with open minds and hearts. 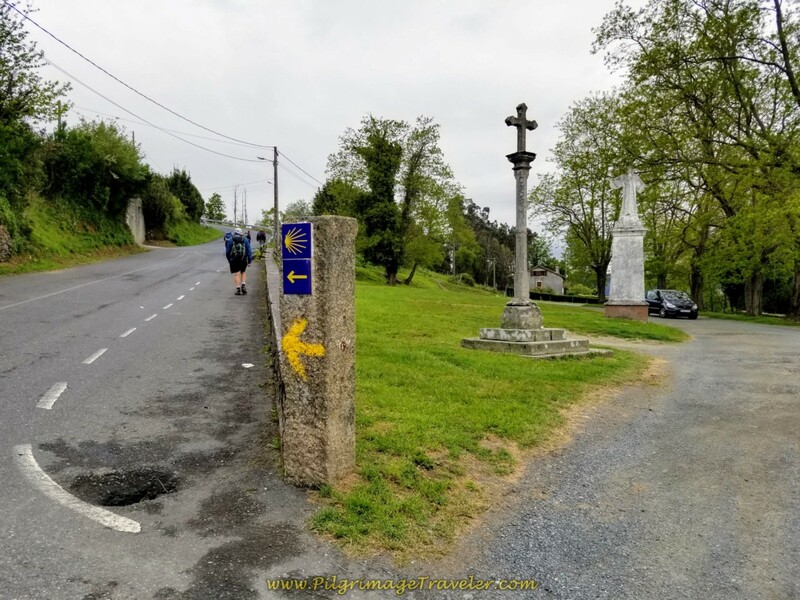 The Camino has taught me a lot over the years, and it seemed that surrendering to what is, is a repeated theme! 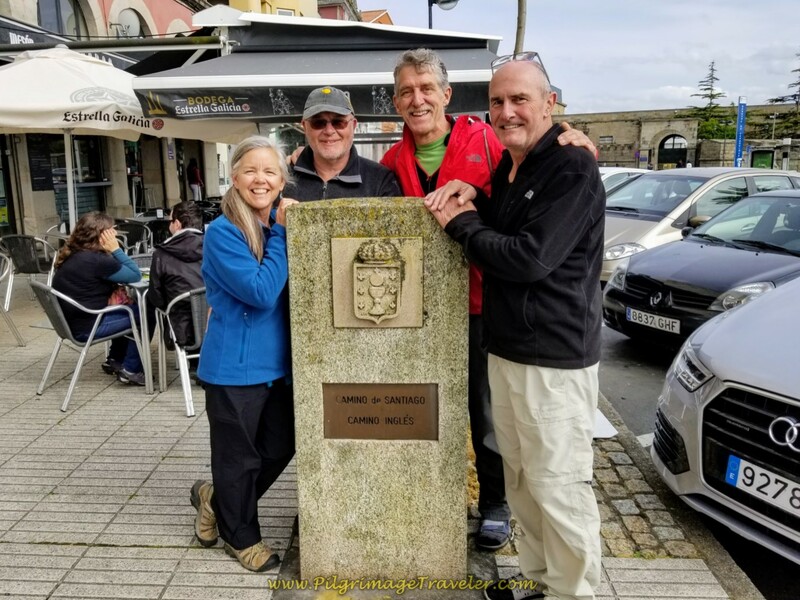 The official start of the Camino Inglés is at this plaque, below, rather hidden behind the café tables at the restaurant across the street from the tourist booth. This is on the street called the Paseo Mariña. For more details, you can go to the introductory page to see exactly how to find it. Look for this arched building just behind the plaque, and a particular archway, shown below, with the first blue Camino sign up on the wall. 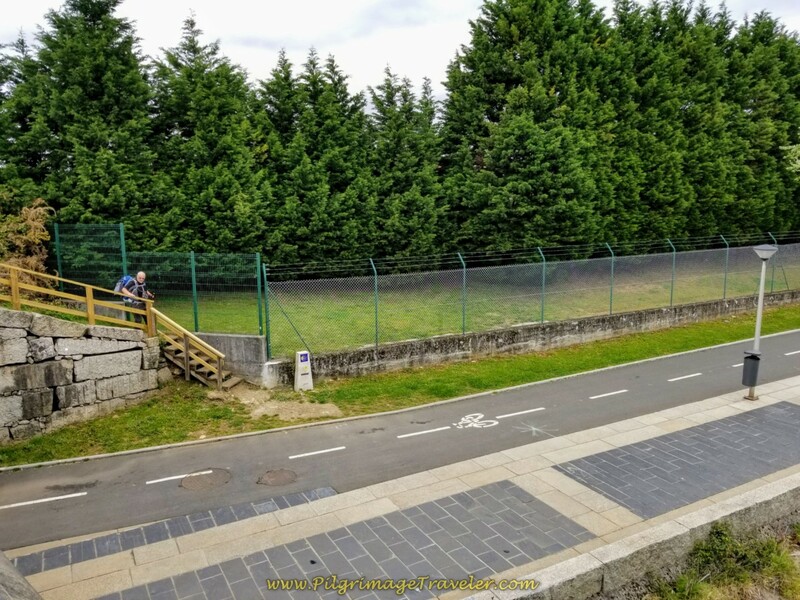 The is the passageway that you must take to start your Camino Inglés. It may be tricky to find this, again, because the café has taken over the sidewalk here. Zoom in on our Google map above, to locate this place. 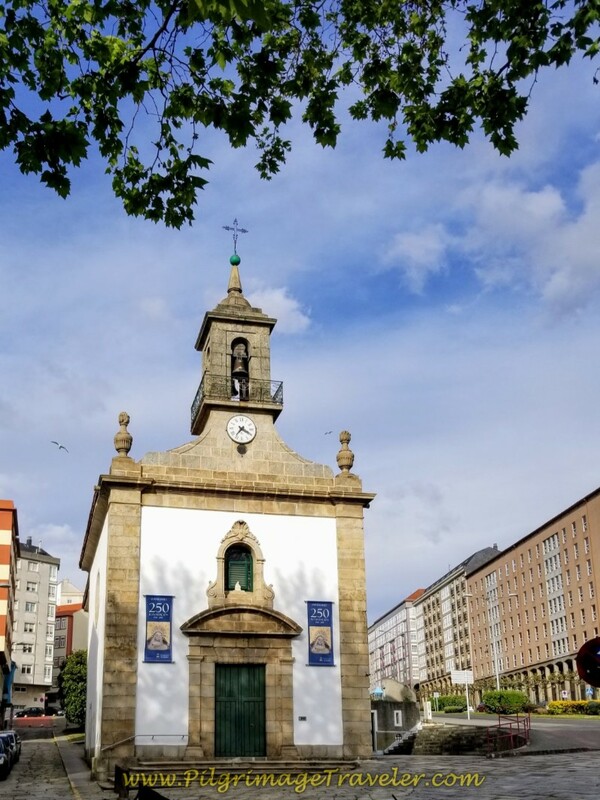 After you pass through the archway and walk down the Rúa Carmen Curuxeiras, you will come to a T-intersection in 170 meters. Turn left here onto the Calle San Francisco, following the blue sign, shown on the gold building, below. These signs are easy to see and follow throughout the city. 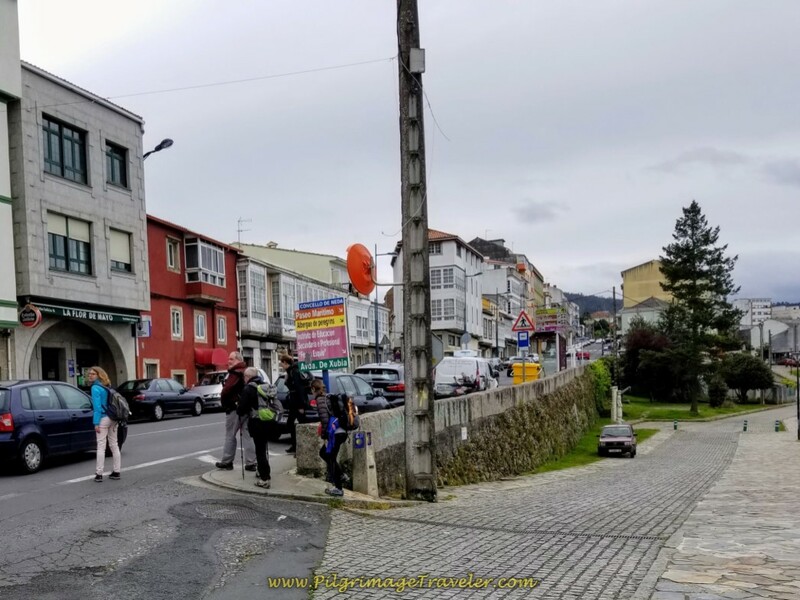 Just after the church of San Francisco, and after 250 meters walking on the street of the same name, join the Rúa Real, by turning right at the first official kilometer marker of 112.8, shown below. 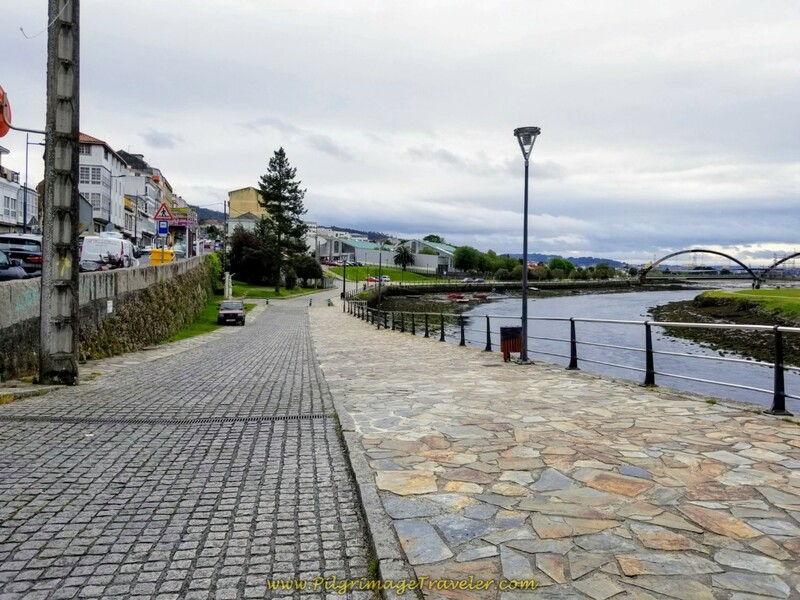 The Rúa Real is the main street for just about everything in Ferrol. 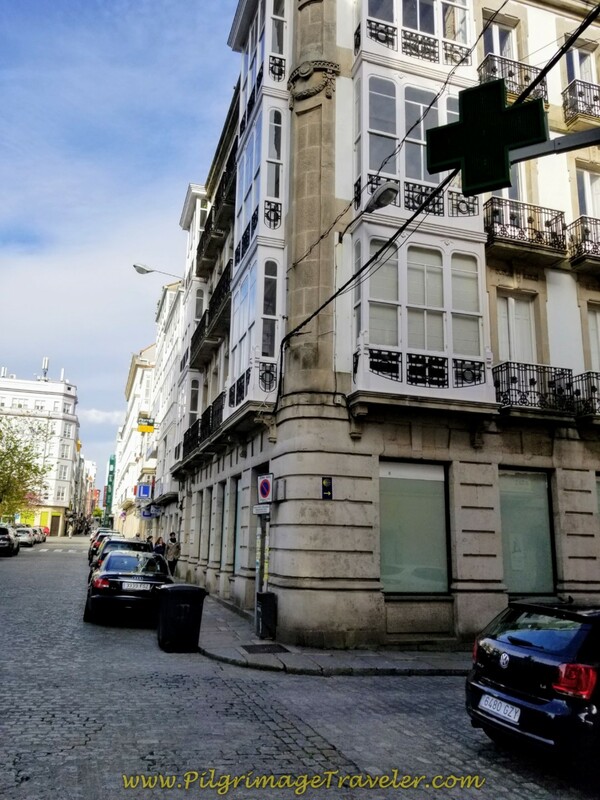 The Parador of Ferrol is to your right at the turn. If you are feeling like a splurge, click on the link to see more. 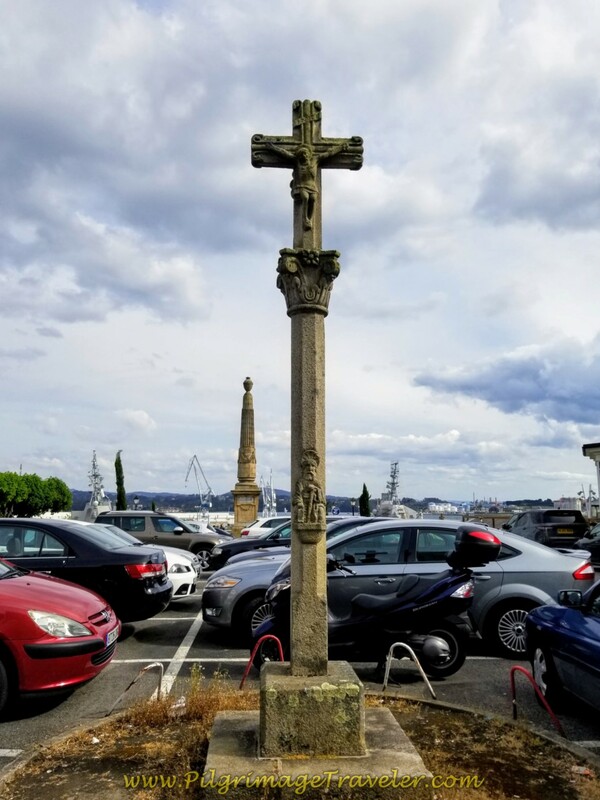 Just beyond the Parador is this nice cross to Santiago, below, with a view of the harbor in the distance. 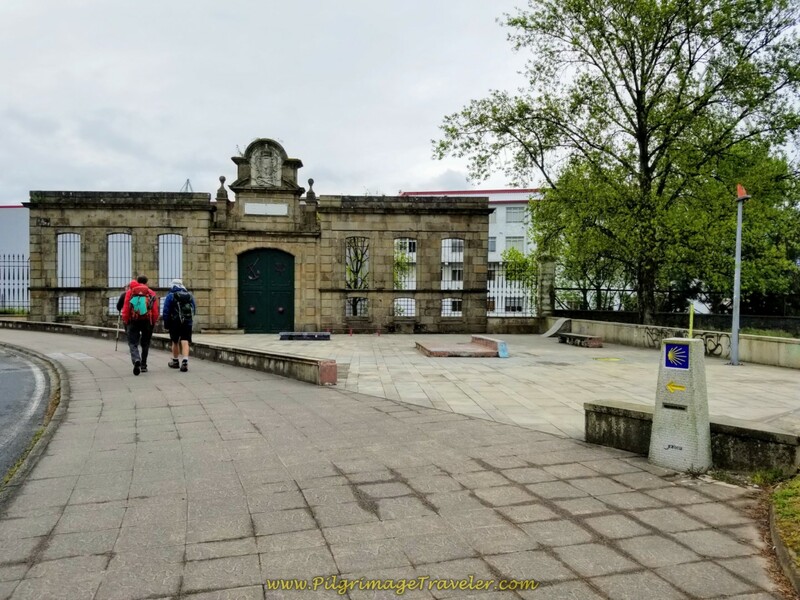 Continue walking on the Rúa Real for just less than one kilometer, passing the large plaza, below, until you see the Camino sign to turn right onto the Rúa Terra, also below. 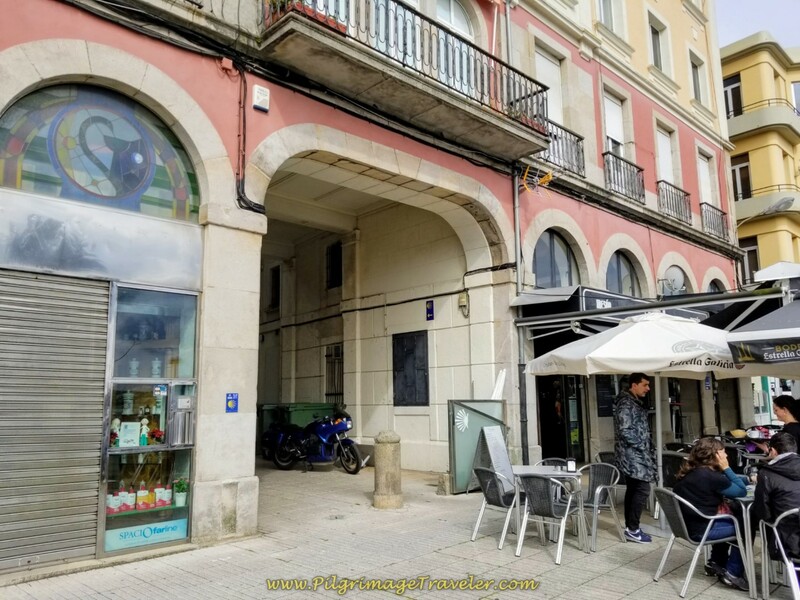 This intersection is across from the Ferrol City hall, shown below, so you can't miss it. 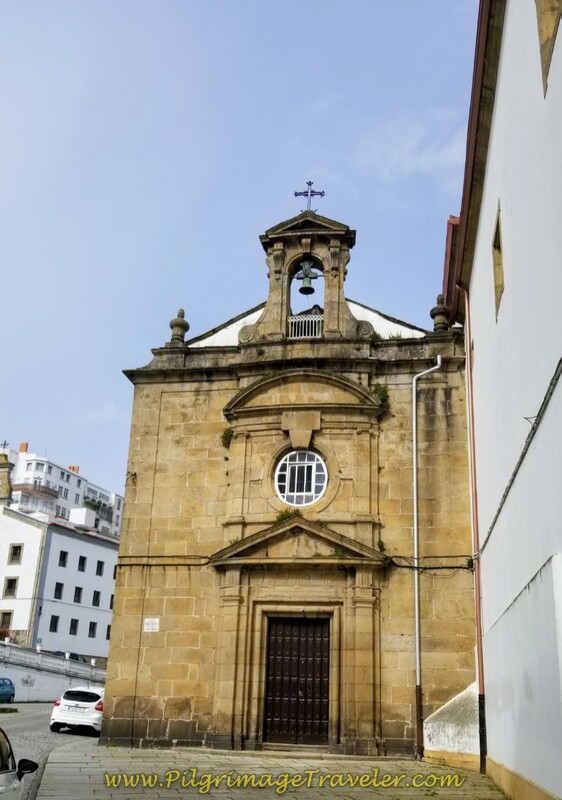 Since I knew the general direction we needed to walk, I crossed the plaza, keeping the street to my left, and in a south-easterly fashion, heading towards the church below, the Santuario de Nosa Señora das Angustias Claretianos, across the plaza on the eastern side. Walking through the plaza is about 300 meters in length. This proved to be the correct way as I saw a concrete waymarker on the street close to the church. 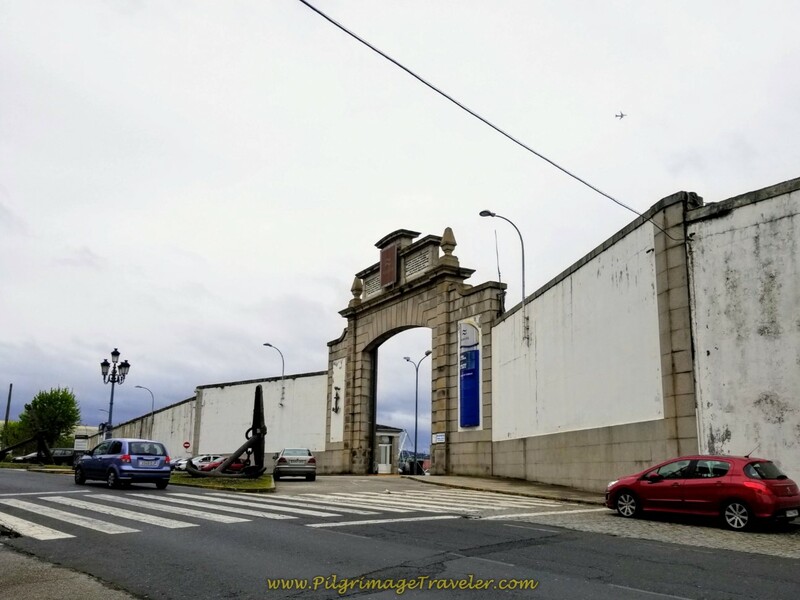 Use the crosswalk beside the church and head towards the tall white walls of the Navantia shipyards, shown below. 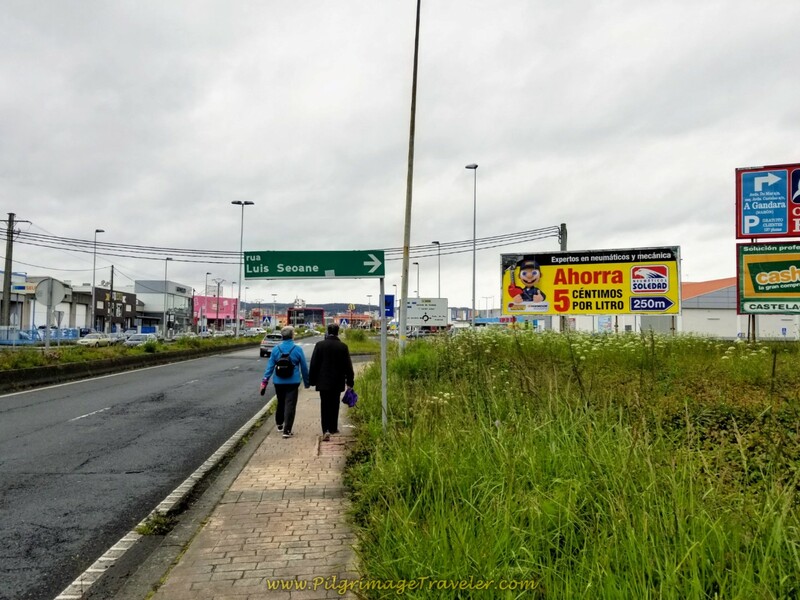 Turn left onto the street called the Rúa Taxonera. 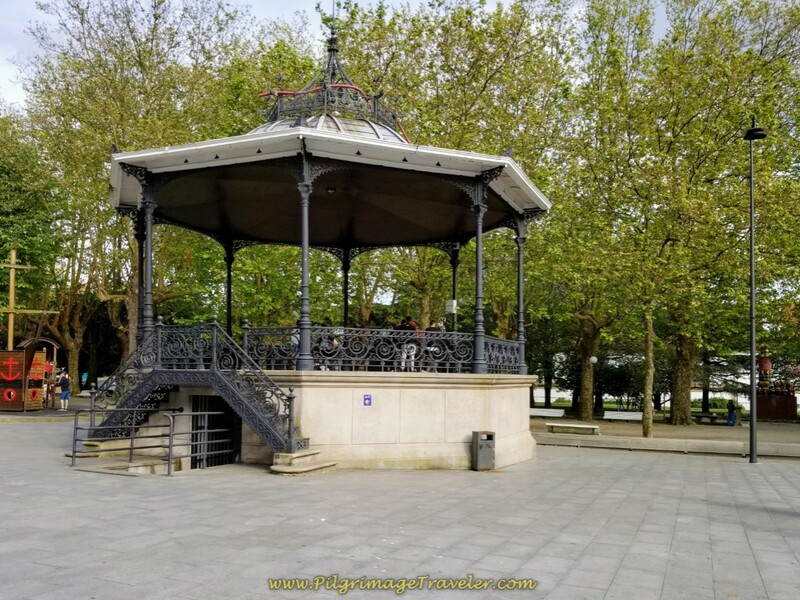 The street becomes the Avenida Mac Mahón as you walk by the military installment, below, after about 1/2 kilometer from the park plaza. There are many cafés along this bustling highway, if you need to get a meal. Shortly after the entrance to the military installment, come to a bend in the street as it heads northward and walk by the oldest military arsenal gate, built in the mid-18th century, shown below. 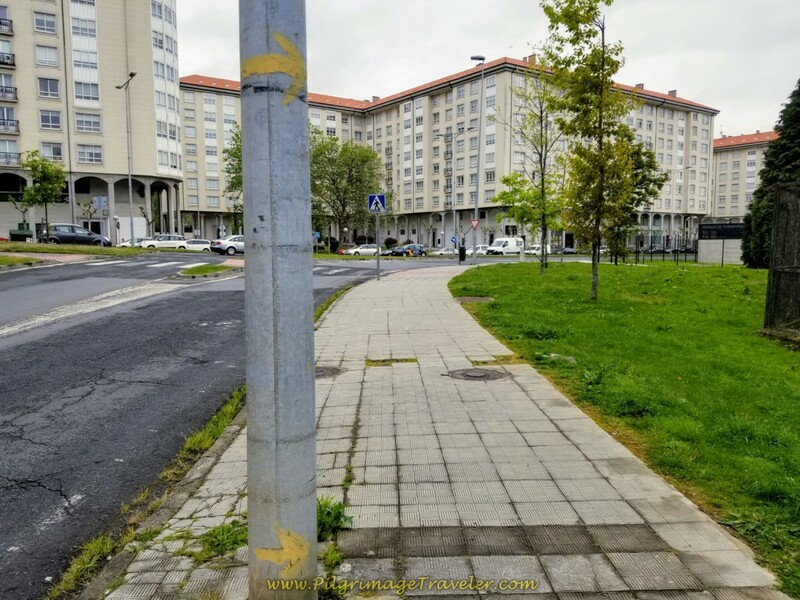 Continue to follow the nice sidewalk with yellow arrows interspersed along the way, through a forest of housing high rise buildings. In about 1/2 kilometer join the Estrada Caranza and bend to the right, back to the easterly direction. 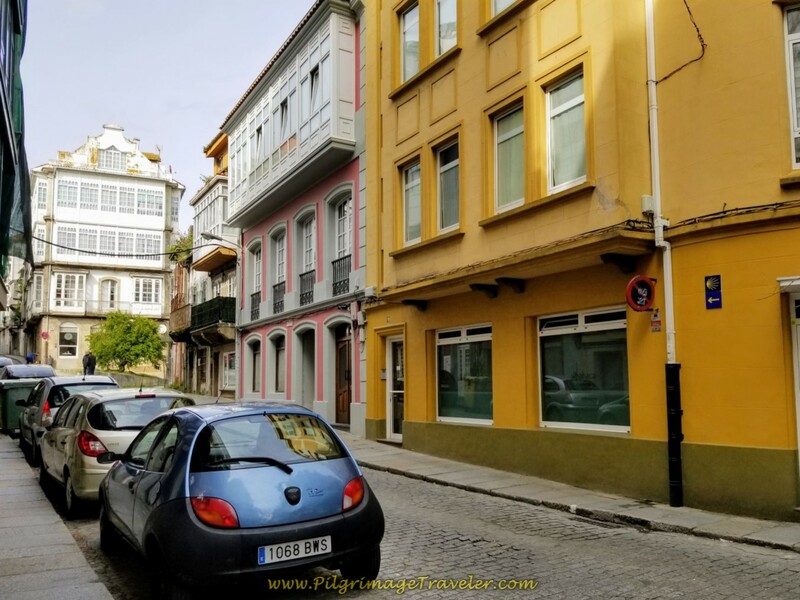 Walk several hundred meters more, through the district of Caranza and come to a roundabout, taking your first right onto the Rúa Telleiras. Walk another 1/2 kilometer and see this waymark, below where you turn right off the highway and onto a nice path leading to the waterfront. 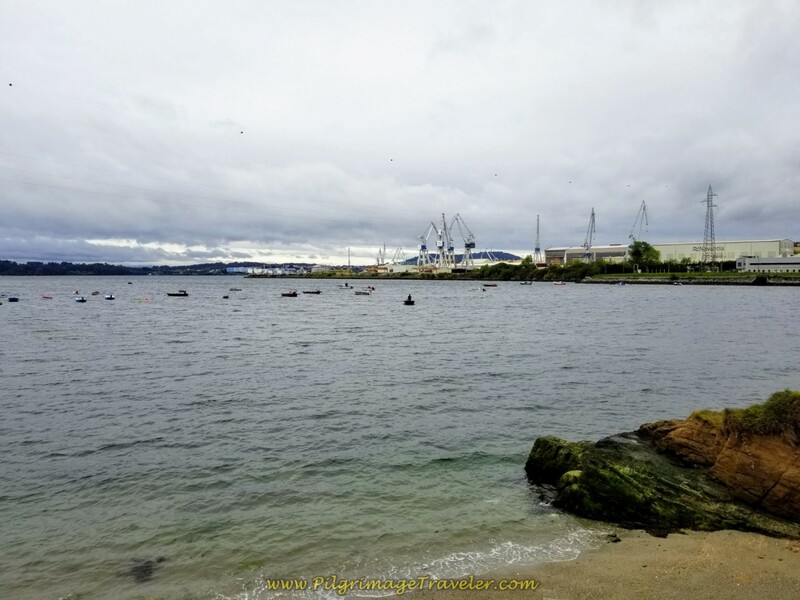 As you can see it was a cool, blustery day in Ferrol in early May, when I shot these photos, and it was threatening to rain. 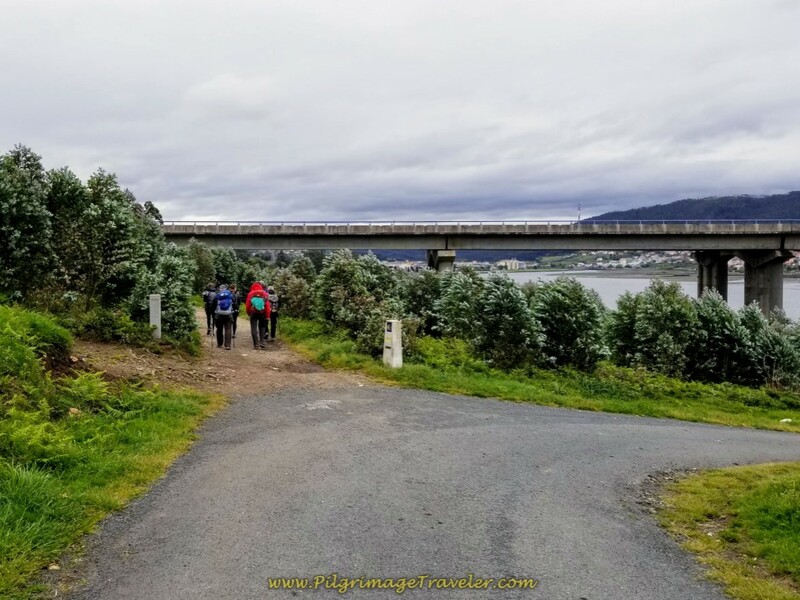 Walk along the river front for about 3/4 kilometer, with sweeping views of the Ferrol estuary and the shipyards behind you. 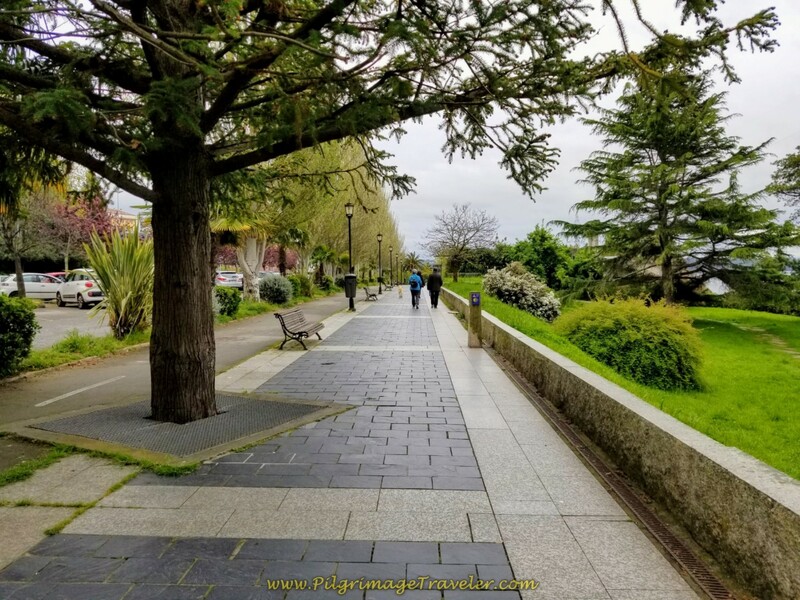 Next, join the lovely promenade that runs along the Avenida do Mar, below. 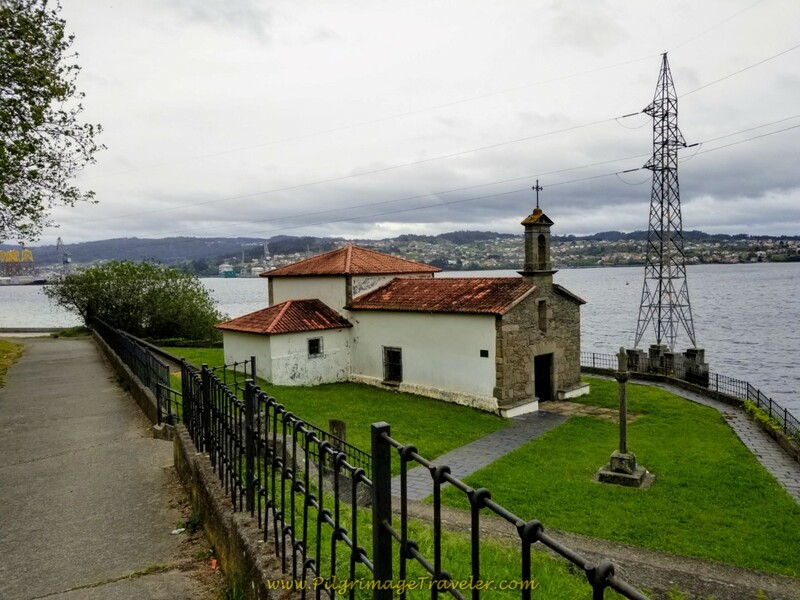 Leave the Avenida do Mar and walk on a path that takes you onto a small peninsula that juts into the estuary and a park where you walk by the lovely little Capela de Caranza, by the sea. I always like to breathe a prayer of gratitude when I pass by a church, so I did! Just past the Capela is a beach-side path, where you turn left, below, to stay off the beach, unless of course you prefer to walk upon it! This nice path continues just beside, but not on the beach. 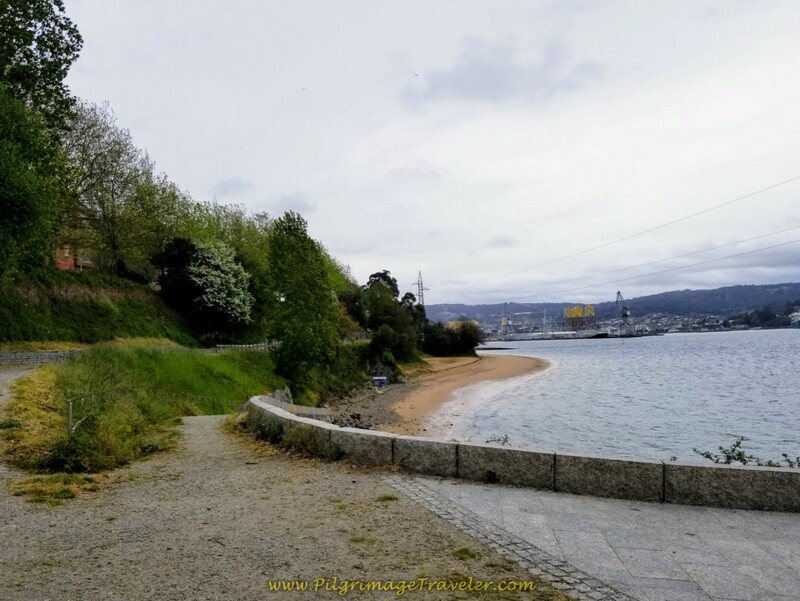 As the path rounds the peninsula on the other side, it rejoins the Avenida do Mar, below. 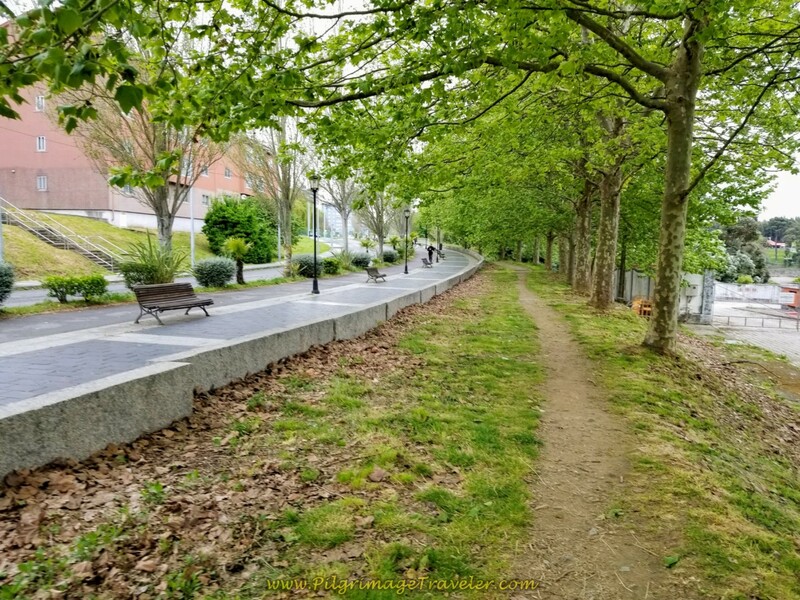 You have the option to walk on the casual dirt path beside the promenade, or on the hard surface itself. In a few meters the path drops below the street level on this side road. You could actually keep walking up on the promenade on the street level, if you desired. It may be a safer option for single pilgrimage travelers. 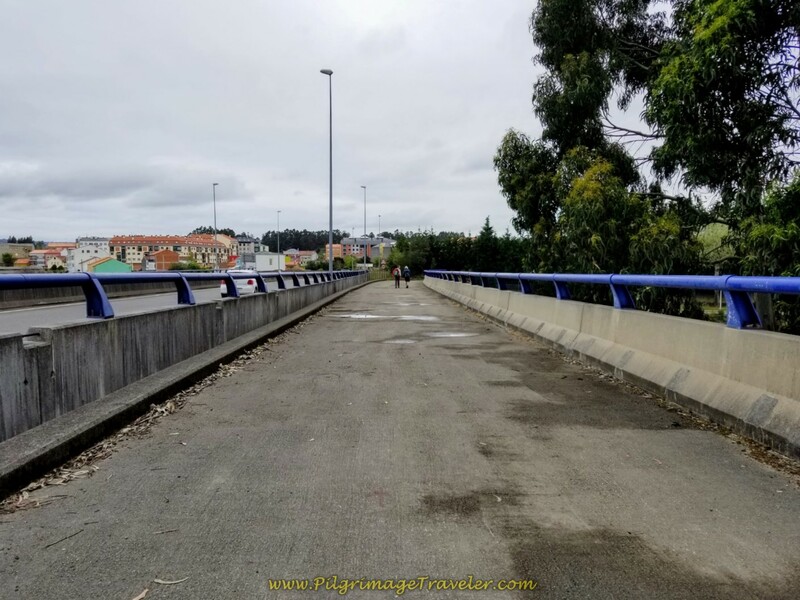 The path does join up with the Avenida do Mar again, the promenade has now ended, and the Way takes you a few more meters toward this overpass. All-in-all it is about 1.5 kilometers of very nice walking around the peninsula on the dirt path before joining the pavement again. 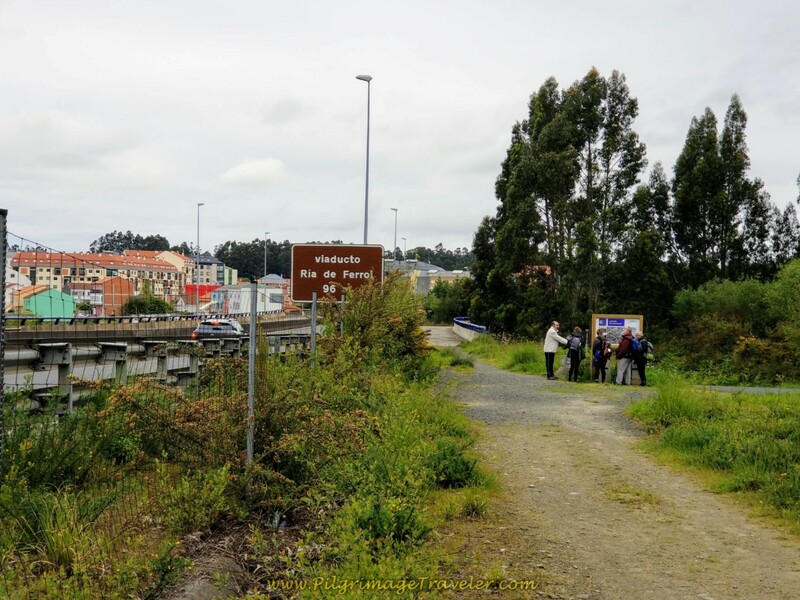 Next, you walk under the highway, shown above, and in about 1/2 kilometer, turn right here, onto the Rúa Luis Seoane. 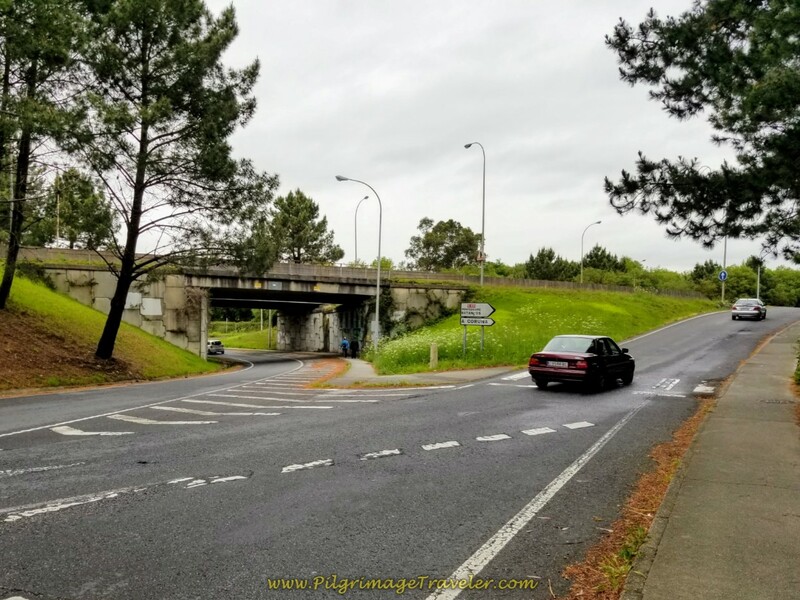 You are now heading into the heart of the industrial area in Ferrol on day one of the Camino Inglés. Mercifully, in a few hundred meters, the Way turns right onto this path. 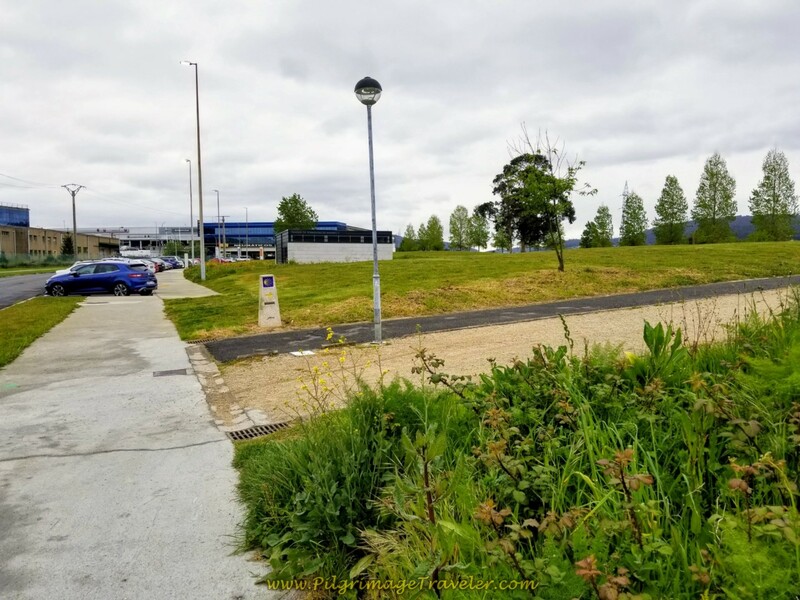 This is not a bad walk through the industrial zone with a park and picnic tables, for about not quite one kilometer on day one of the Camino Inglés. 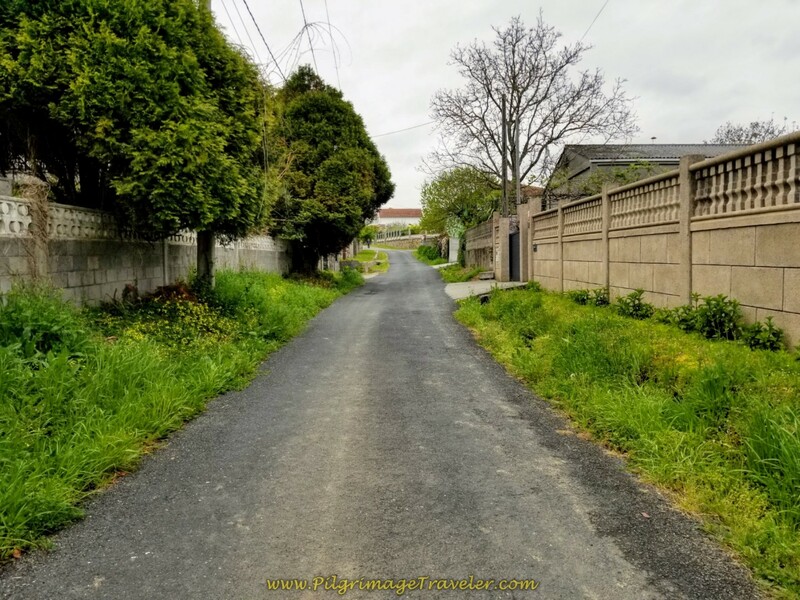 Then the path ends, and turns right to re-join the pavement of the Avenida do Mar once again, to walk through more industrial loveliness in the Gandara district! In a few meters come to a large roundabout, but stay to the left of it until the Avenida comes to an end. 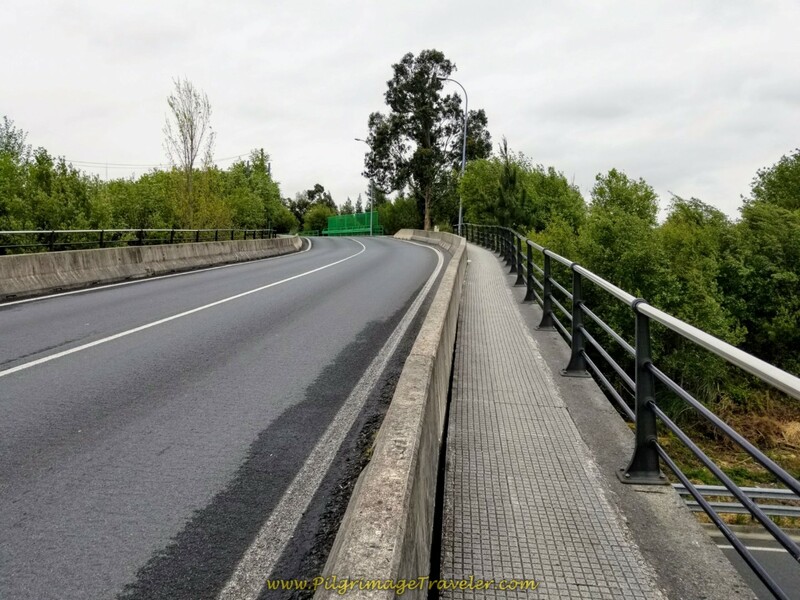 Turn right on the Carretera Gandara and walk over the FE-11 on this overpass, below. Fortunately, just across the bridge, The English Way on day one turns right onto this lovely path. 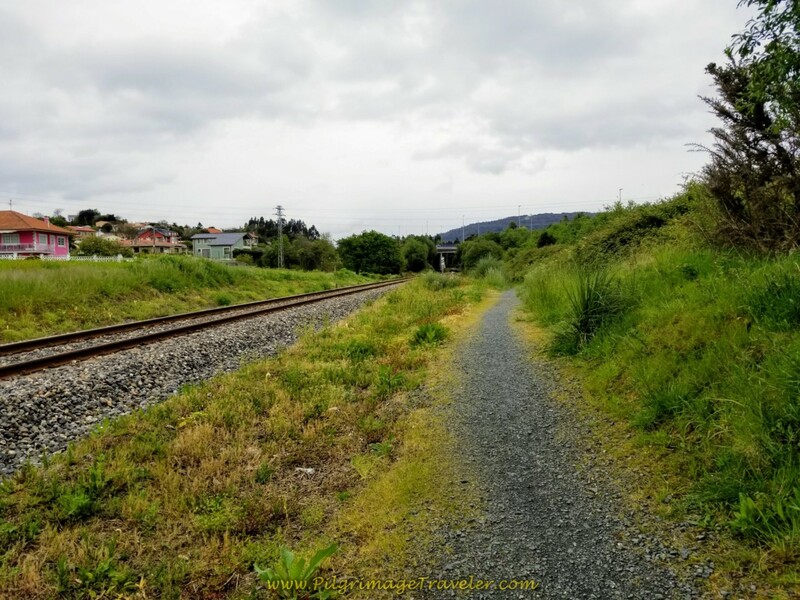 The path joins the railroad tracks and walks next to them for several hundred meters. ...and from the tunnel, the path is now brick and begins the very steep climb of the day. Yahoo! 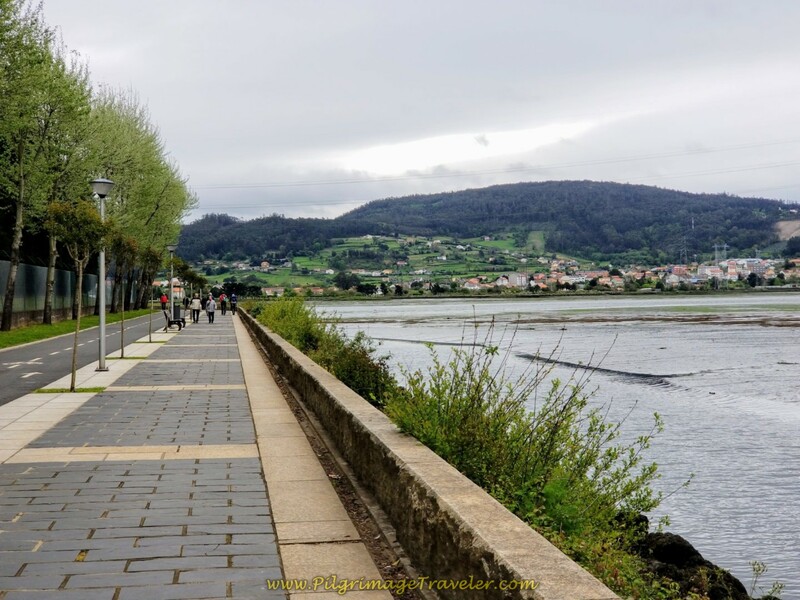 It is about 400 meters total on this path when it joins the road, the Camiño do Vilar, shown below, as the Camino keeps climbing. 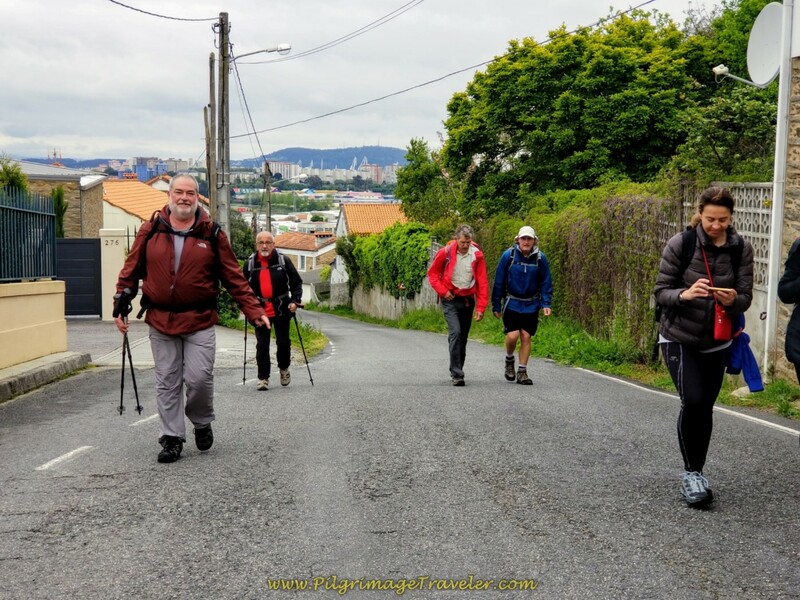 We caught up to a group of Spanish pilgrims on the long climb. We are skirting the town of Narón to the south, in this section. 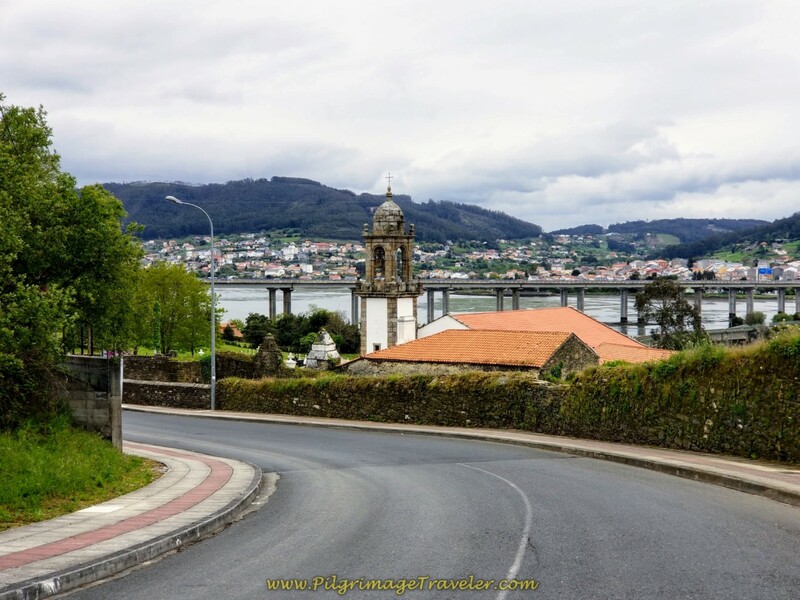 Follow the Camiño do Vilar until coming to this intersection where you turn left onto the Av. Souto Vizoso and continue climbing the remaining part of the steep hill. Turn right in only a few meters and you have reached the top of the steep hill after a bit more than one kilometer of climbing. The climb was short and sweet, though quite steep. 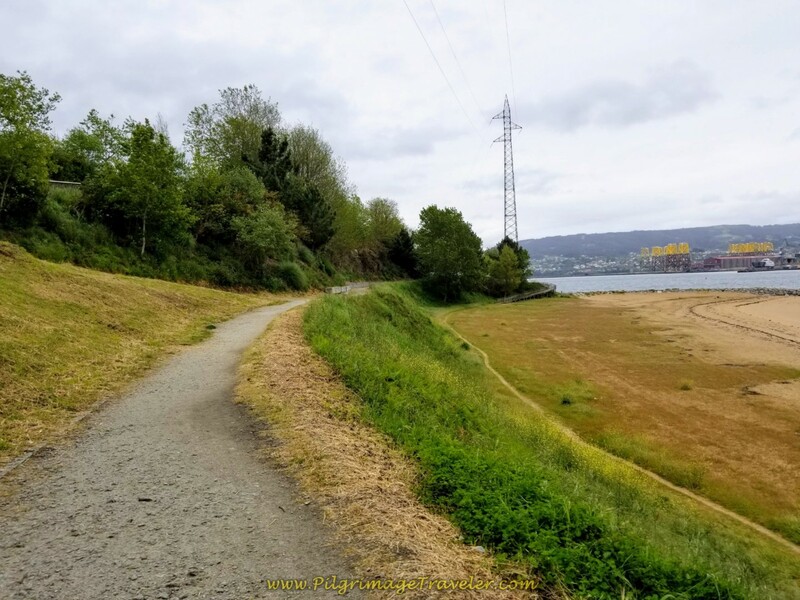 Your reward is the steep downhill on the other side, as you head back down toward the estuary for 400 meters toward the next landmark. 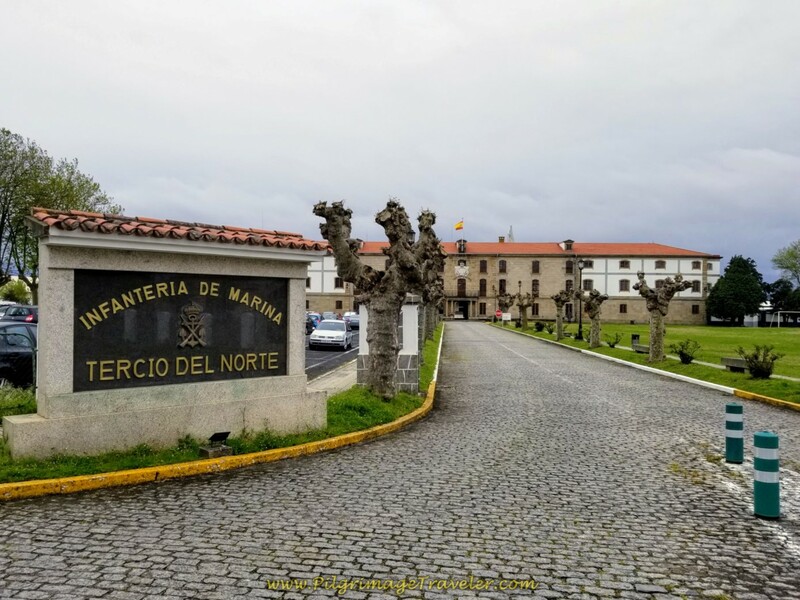 At the bottom of the hill is the captivating monastery, the Monasterio de San Martiño de Xubia. This is a very tranquil place, if you can spend some moments here on the grounds. 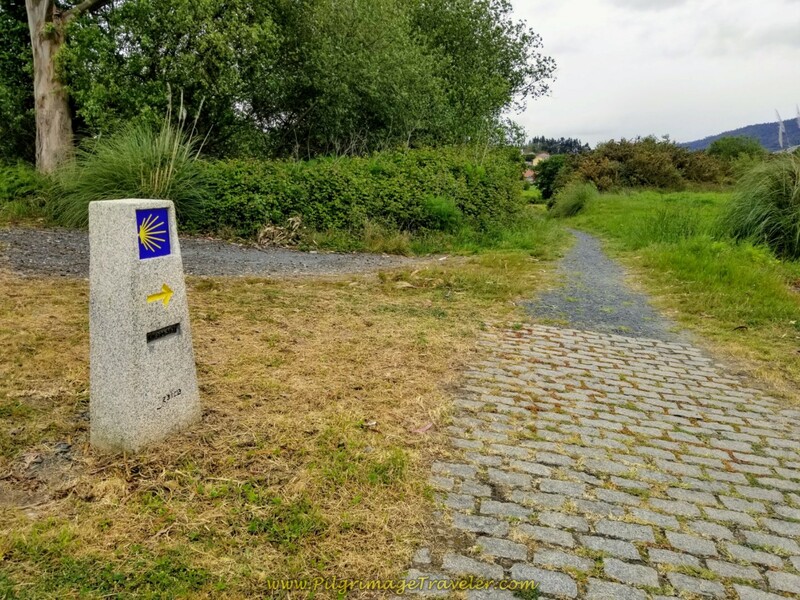 There is a cross and a statue of an angel to contemplate before you push onward, as the Camino turns to the left and up another hill, shown below. The hill is short-lived, as you turn right in another few meters onto a side road. 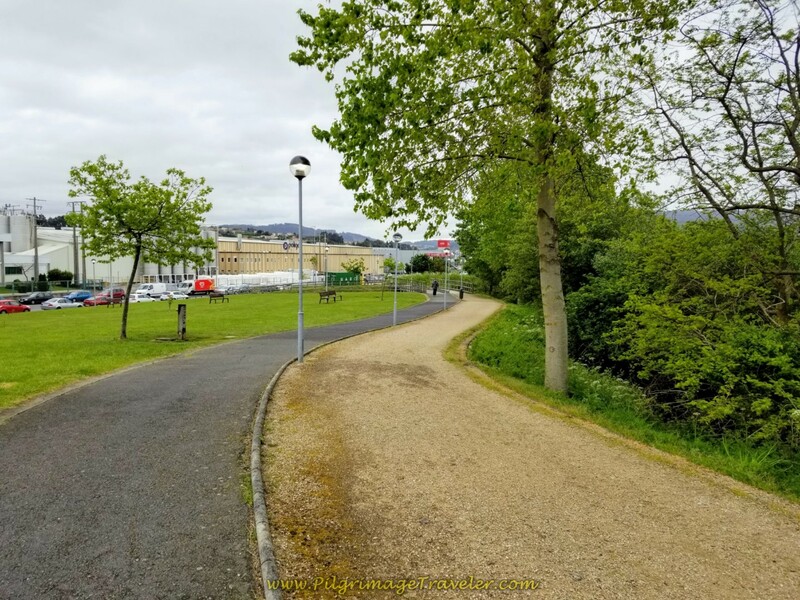 From the side road, in several hundred meters more the Camino turns left on yet another nice path, as it continues to follow the river, shown below. 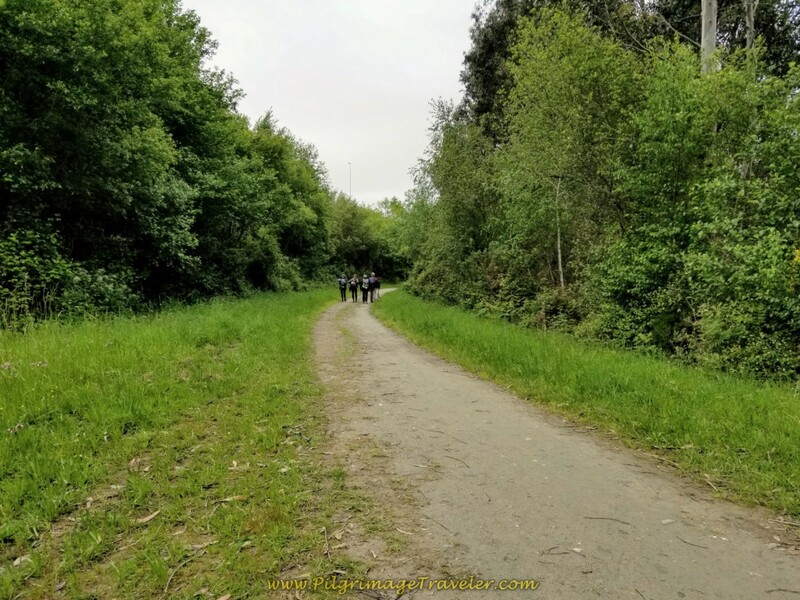 This path widens, essentially following the line of the FE-11 highway, which you can see through the vegetation at times. 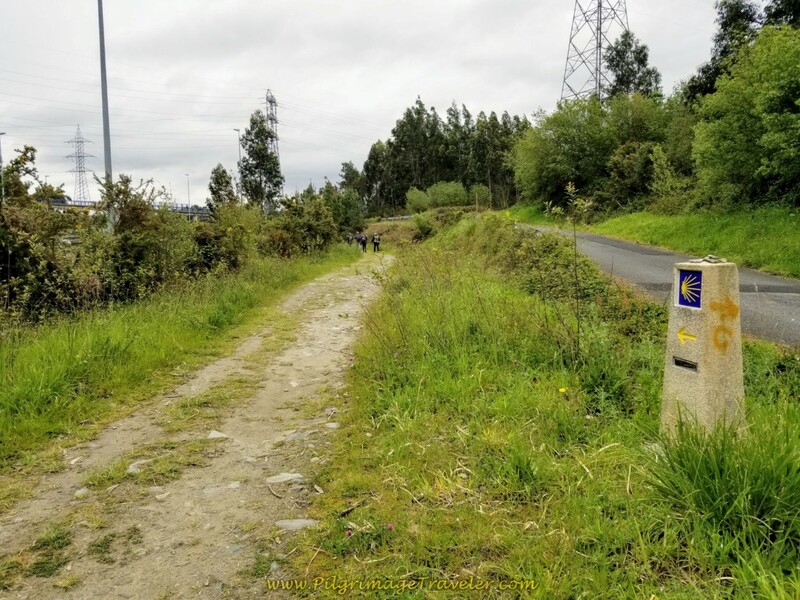 This nice off-road Camino carries on for about 2.0 full kilometers and makes a pleasant walk on day one of the Camino Inglés. Here are the gentlemen, chatting away. I believe it was Rich doing most of the chatting! And then we arrived at the end of the path. We noted our Spanish pilgrim friends clustering around the board ahead by the bridge. 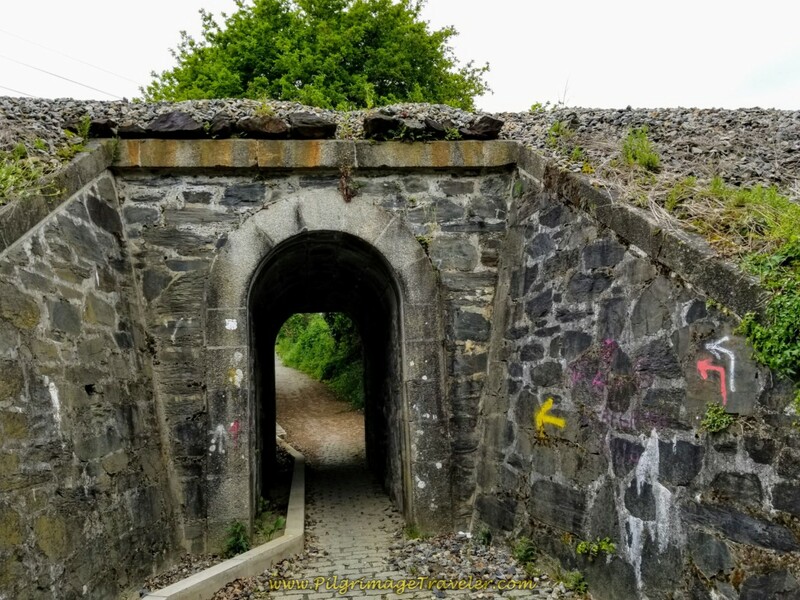 There were two choices going forward, the "Supplementary Way" to the right at 1.47 kilometers long, and the "Main Way" to the left for 160 meters. The longer route continues around the estuary and passes natural and historical sites. We voted to go the shorter, more direct Main Way. The Main Way takes a shortcut across the footbridge, below, as it continues to follow the FE-11. From the viaduct, the stairs lead down to another riverside promenade. 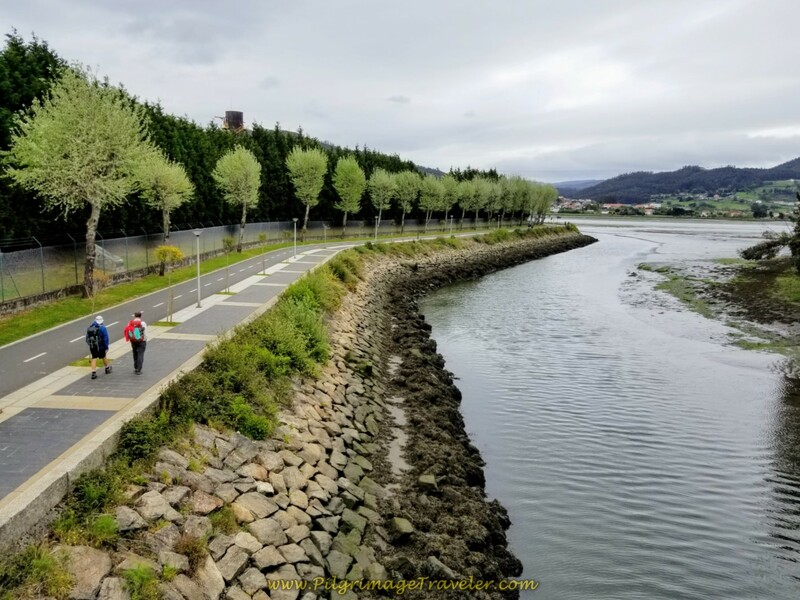 The way ahead from the bridge looked absolutely fabulous in the spring of day one on the Camino Inglés. Ever the curious one, as I walked down the stairs from the viaduct, instead of turning to the right, I went left, and backwards a bit along where the Supplementary Way joins the Main Way. 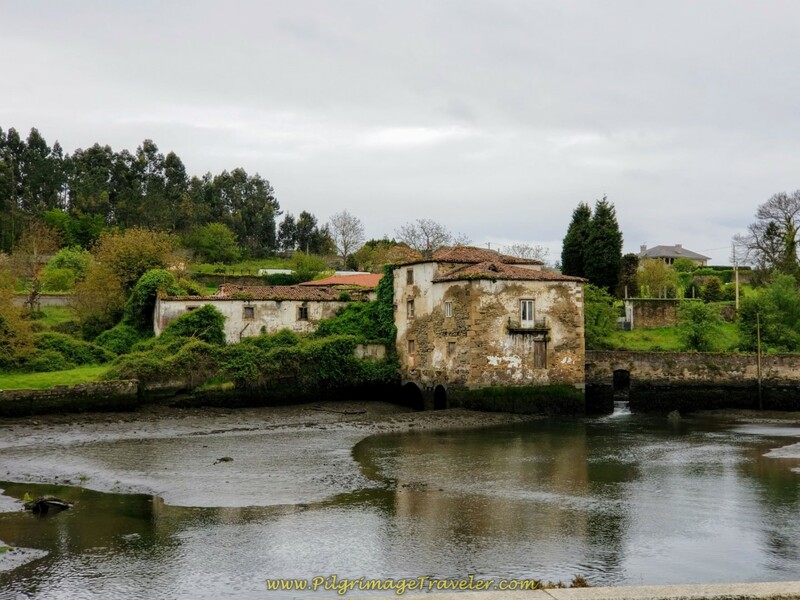 I could clearly see one of the main historical buildings on the route, this wonderful old watermill. It is a picturesque sight, indeed, and worth the few steps backwards to see it. Then back I went to join the gentlemen on the regular route. The rain continued to threaten, so I suppose it was all good that we took the shortcut. As we got closer to Neda, we passed the 100 kilometer marker. 13 kilometers down, about 100 left to go! From across the river you can see the albergue, the one-story orange building to the right in the photo below. Unfortunately, the footbridge, also shown here was under construction and was closed at the time of our passing. Going all the way around to the traffic bridge (see the map) probably added another 1/2 kilometer to the journey. 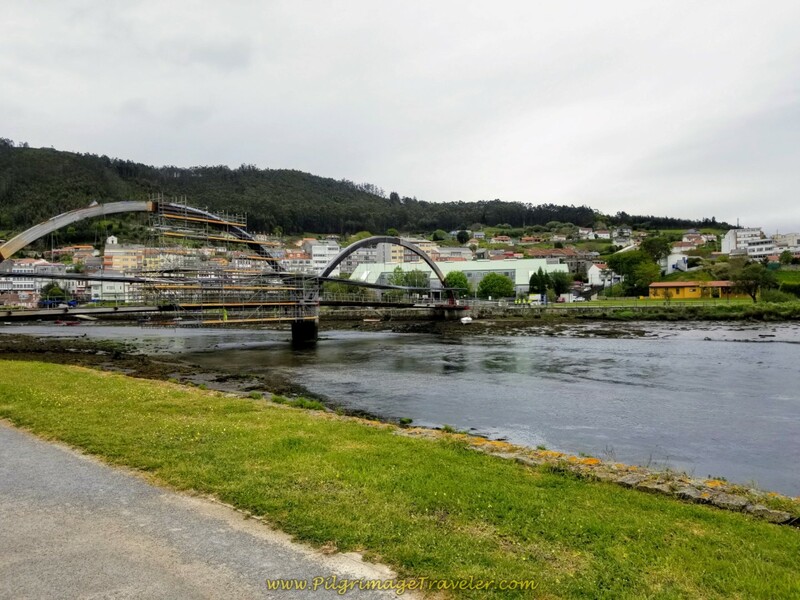 ...and to the traffic bridge, the Puente de Narón, after a total of about 1.5 kilometers on the river promenade. We crossed the bridge to come to a nice-looking café bar on the other side, to the left, La Flor de Mayo. Other pilgrims had the same idea that we did - time for a break at mere steps from the albergue! After our lovely break, it was onward for the next few hundred meters to the albergue. Here is the brightly-colored building. 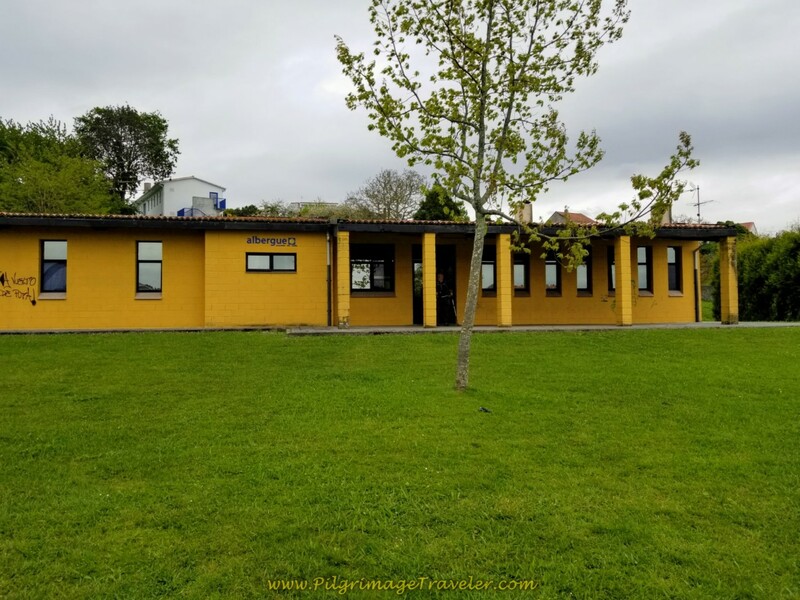 The albergue is adequate and essentially comfortable, but not new. There are lots of available blankets which was important to me since I was only carrying a sleeping bag liner. The day was very cool and the sky proceeded to open up and pour rain later in the afternoon. We were lucky to have beaten the long downpour! Neda and the adjoining town of Narón are decent-sized towns with many amenities. There are grocery stores, many cafés and family-run accommodations. Click here to book ahead if you desire. We four decided to go to the small grocery store up the street and cook dinner at the albergue. The cooking facilities are good here. We cooked up the special local sausage (chorizo) that a bystander at the store recommended to us and it was fabulous. We threw in some pasta and zucchini to the pot, added plenty of red wine to accompany the meal and our pilgrim bellies were content! Our night was a bit rough, as someone forgot to turn off his alarm on his phone. We all woke suddenly, about 4:oo a.m. to a rooster crowing! The pilgrim turned it off. Then about 15 minutes later, the rooster crowed again! OMG. The man hit the snooze instead of the off button. A woman started laughing hysterically. What a charade! Needless to say, I didn't sleep well after 4:00 a.m. It is my witching hour anyway, when I tend to sleep much lighter, and I was unable to settle back into any real meaningful sleep. 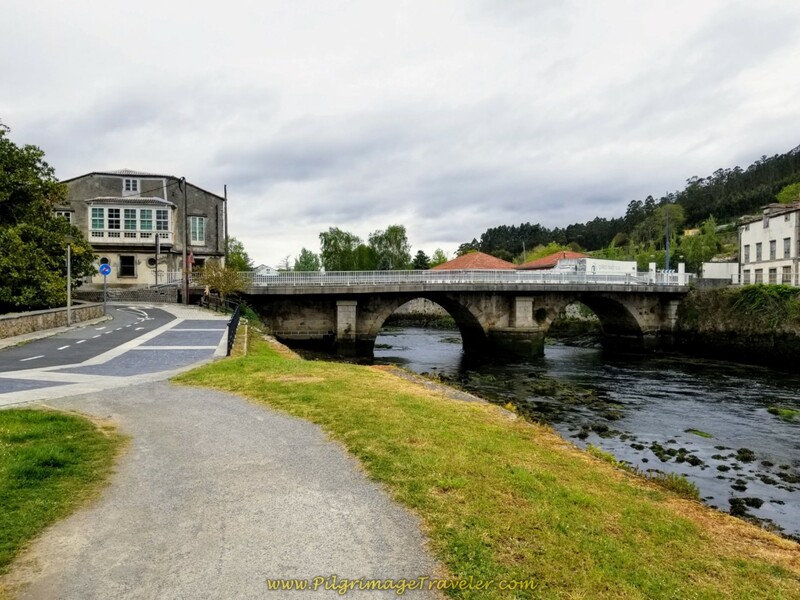 The beauty of albergues! 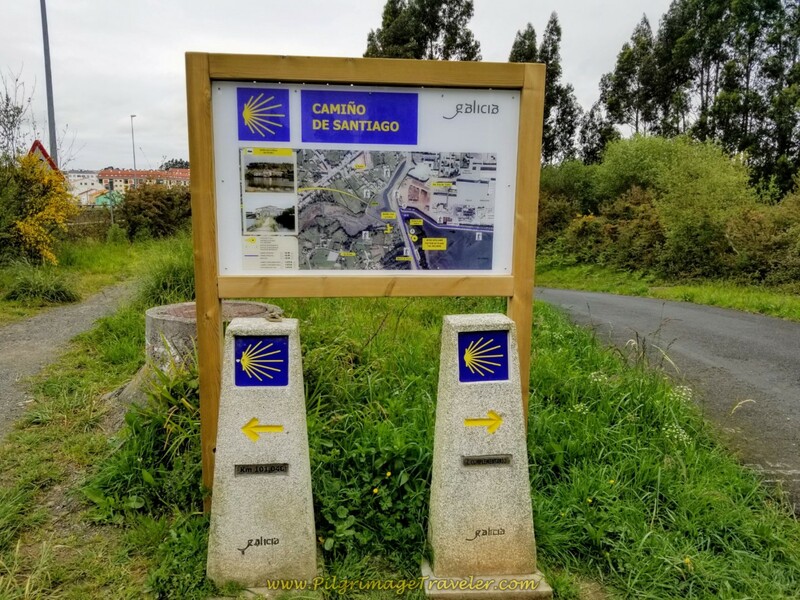 All-in-all our day one on the Camino Inglés went without a glitch. We were all walking strong, enjoying the day, having completed the 12 kilometers in less than four hours. 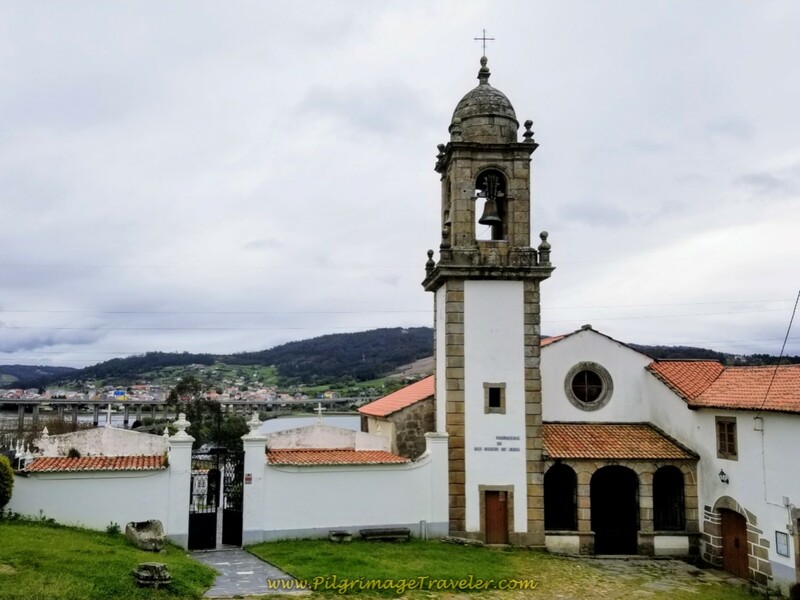 We had a long luxurious afternoon watching the rain from the local bar and the albergue, as we watched one pilgrim after another come in from the pouring rain. 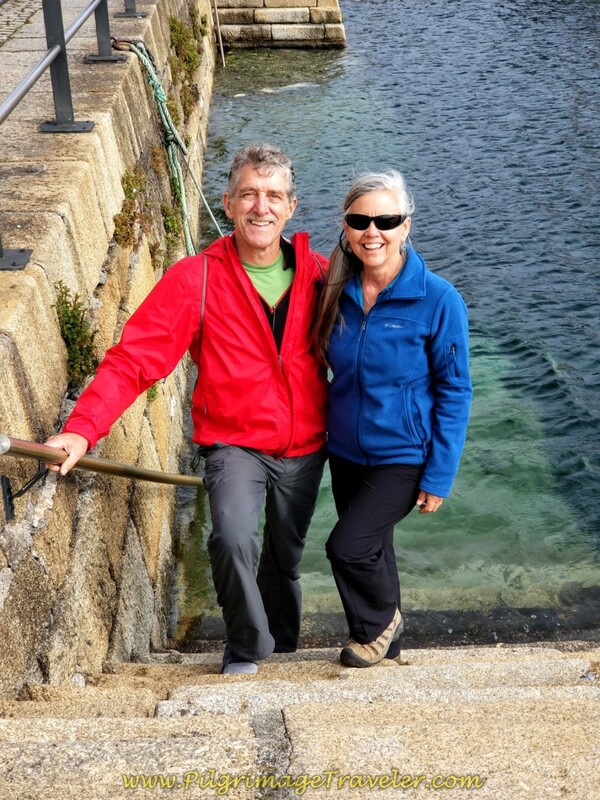 Had we tried to reach Pontedeume, undoubtedly we would have gotten soaked. Even though to me this day felt like just a warm-up, in regards to our usual long days, I was content. 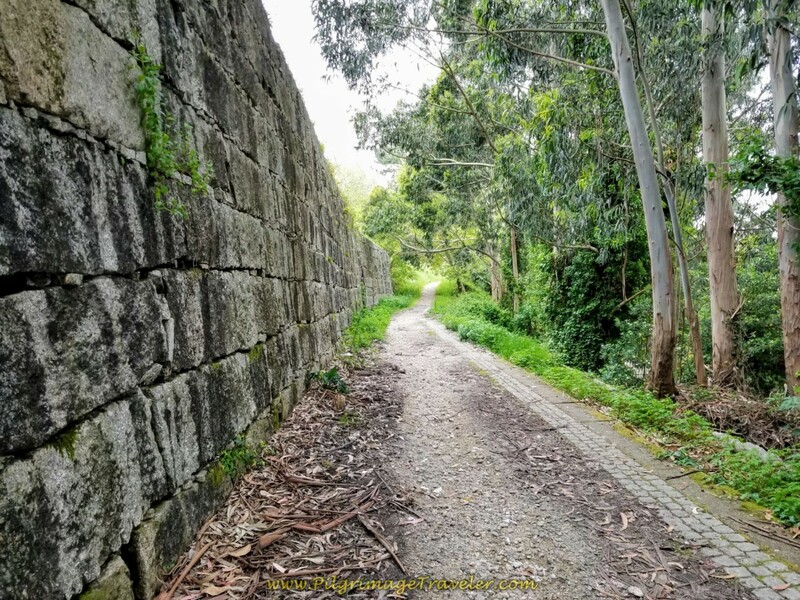 With so many levels of skill on the Caminos, I thought this was a perfect opportunity to keep each day short in my writings about the Camino Inglés. I would design the stages for a more moderate ability, so that the very strong walkers could easily combine the stages as they so desired. An eight-day schedule for the Inglés would meet almost anyone's needs, even though the four of us did not take a full eight days to complete it. It took us six ~ a major accomplishment for a person with Parkinson's. 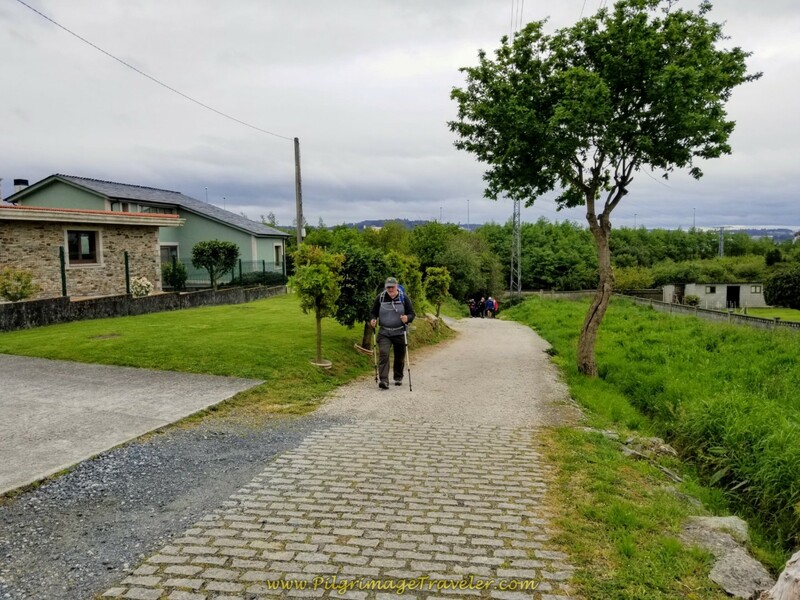 Looking at the Camino through the eyes of others of all abilities was the way I chose to go deeper into my own pilgrimage. I hoped to commit to this type of pilgrimage going forward, even after my journey was over. 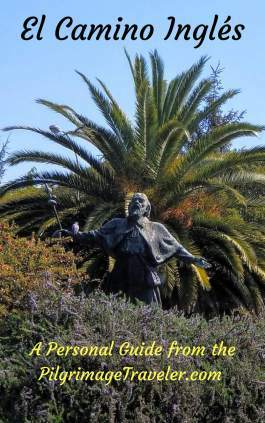 May your own day one on the Camino Inglés be a pilgrimage that never ends, as you deepen your own personal journey! Ultreia!